Being abroad is a wonderful experience, full of new and exciting things to see, do, and eat. Even if you are someone who enjoys being alone, you are going to need a couple of friends to support you, explore with you, and take pictures of you doing every tourist-y thing possible (such as jumping on street trampolines). Even for the most extroverted students, having to make a whole set of new friends in a short amount of time can be difficult, but not impossible! Below are five easy ways to make lifelong friends while abroad! The moment you are assigned your housing, I encourage you to reach out to your roommates (or fellow floormates if you are in a single). Friend them on social media and simply start a conversation! Although DIS does an amazing job pairing roommates together, it can be such a relief to confirm that your roommates are not crazy. Personally, I got paired with two roommates, both of which I reached out to via Facebook and simply started a conversation to learn more about them. When I finally arrived in Copenhagen and their smiling faces were already in my room, I felt like I was being welcomed home. Don’t be afraid to introduce yourself! Okay – not always; please make sure the situation is safe and legal first. But once that is clear, say “yes” to almost every opportunity! Even if you feel tired or are worried about finishing your reading due tomorrow, go out if you are offered the opportunity. Go try a new food or go for a walk along Nyhavn with your roommate. After all, when you look back on your experience abroad, it is these little moments that you will remember most. 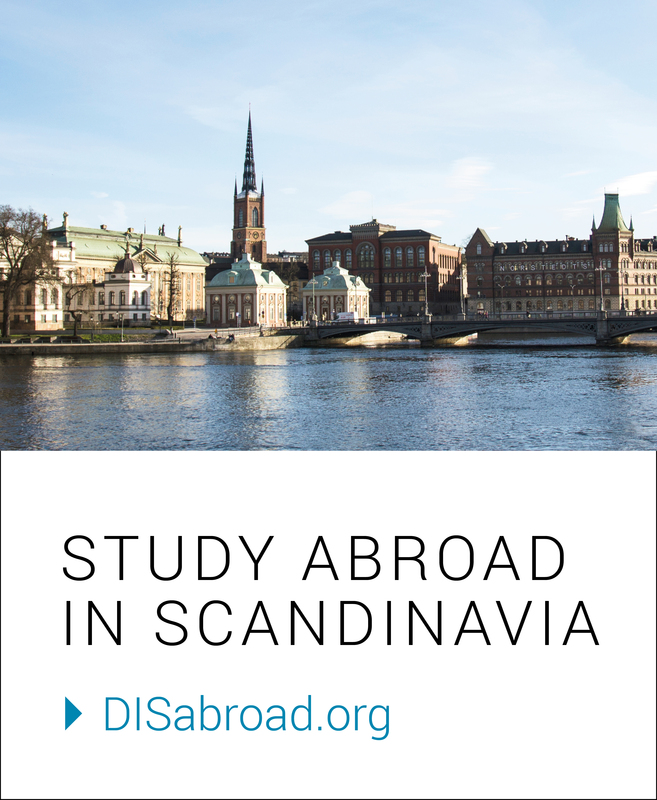 Obviously, school work comes first while studying abroad, but try not to pass up too many opportunities. Exploring and connecting with other people is one of the best ways to truly get to know your fellow DIS students. Don’t stay holed up in your room or in the library forever! You and everyone in your class already have something in common: the class. Use this common connection to start a conversation. Get to know them more: Why are they taking this class? What is their major? What career do they aspire to have? Where are they from? Where do they go to school? Where are they living in Copenhagen? You might soon discover that you have even more in common with a classmate than you originally thought! Also, getting a small group together to go grab lunch, explore the city, or study together at Studenterhuset after class is very convenient because you’re already in the same place. Some of my classmates and I at the top of the Rundetaarn. DIS understands that it can be tough to be thrown into a new city and new culture where you know absolutely no one. This is why DIS actually hosts multiple Summer Events that allow fellow students to meet and bond. Last week, I attended one of the Summer Events held at H.C. Ørstedsparken (a beautiful park). DIS provided hot dogs, s’mores, music, and games. All I had to do was show up! We cooked our own hot dogs and s’mores while laughing together and sharing our experiences from the first week of being abroad. It was a wonderful way to relax and enjoy the afternoon with other students and a really easy way to meet new people. If all else fails, just keep smiling. While being abroad, there will be good days and there will be bad days. On the bad days, it is important to remember that the situation is only temporary. On the good days, remember to take a step back and savor the moment. Also, smiling definitely makes you more approachable! Keeping a positive attitude will enhance your experience and help you find at least one person who you truly do connect with. Before you know it, the hardest part will be saying goodbye to that friend who lives halfway across the country from you. Previous 1 semester in 3 weeks.